What level of value is Information Technology (IT) providing your business? Mid-sized businesses typically have annual revenues between $10 million and $200 million. Often, leaders of these type of businesses believe that Information Technology is a back office function and an expense to be minimized. They believe that IT is absolutely necessary like power, facilities and accounting, but not something they need to think about much because it cannot add true business value. They may believe that the role of IT is limited to providing networking, servers, PCs, laptops and e-mail services. Little do they know that, if managed correctly, IT can provide not only these basic services, but business transformational and strategic value as well. As a Functional Department, IT is just another department that provides a specific utility function – technology services. The main focus of IT as a functional department is on providing the best possible technology services at reasonable prices to the organization while leveraging internal and external assets. Areas of focus include developing IT talent, security management, budget management and managing IT crises. The expected outcome is continuous improvement of IT services. As an example, consider IT help desk and customer service models. In our experience, many IT departments in mid-size organizations struggle to provide an efficient help desk operation because they may possess an attitude of “not invented here,” and choose not to apply advice from available frameworks such as the IT Infrastructure Library (ITIL) that have solved this problem and documented resolution 25 years ago. Another reason many IT groups struggle with process and people problems is because the IT leader does not have the experience of having worked in a larger IT setting where the help desk works well. Over time, they may get something as basic as help desk services to improve enough to become useful to the organization, but still fail to add enough collective value to the enterprise. Once an IT group graduates beyond the basic utility role, these teams can do so much more to become a differentiator. 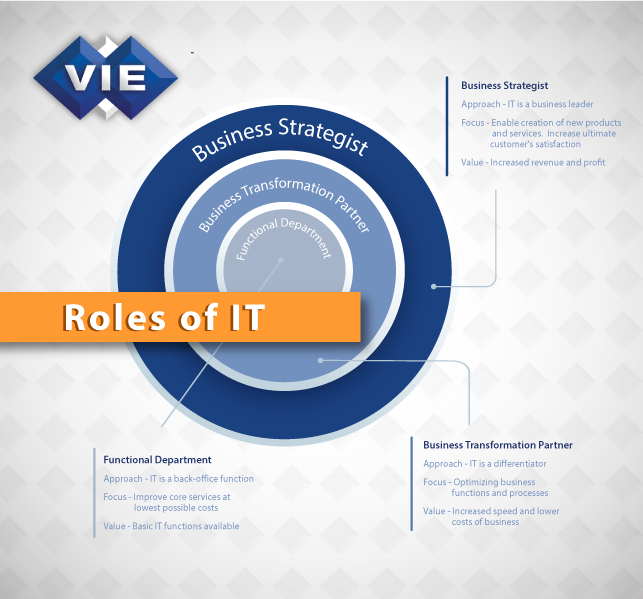 The IT role in any organization is a function of two very important factors: the attitude and capabilities of the IT leader, as well as the attitude and expectations of executive leadership. In other words, the IT role is a dynamic, two-way street. As a Business Transformation Partner, not only does IT provide good IT services, it also collaborates as a business partner with other departments such as sales, marketing, finance, logistics and operations. When thriving in this role, IT leads change efforts across the enterprise, re-designing cross enterprise processes, continually aligning IT to the business, cultivating IT and business group partnerships while implementing new systems to evolve the enterprise. After all, information is the lifeblood of a business, and if leveraged correctly carries with it the potential to speed-up business and save money at the same time. As an example, consider a theoretical sales department based on our experiences with a collection of our clients. This sales department consists of 10 people, some of whom are account managers with others in the role of finding new customers. While most salespeople may have individual preferences that define their selling methods, generally speaking, a larger sales organization must leverage known best practices for how their customers like to buy in order to be successful. This largely holds true because to sell effectively today, it is not about the product and sales techniques of your team members, but more about the buying process preferences of your customers. One way IT can transform business for the scenario described above is to work with the sales department on implementing a solid Customer Relationship Management (CRM) system. The new CRM system should leverage knowledge of the salespeople to determine what works best for a majority of the customers. IT can drive the process to gather this information, then engineer a CRM system that allows sales team members, and their managers, to be much more effective in their roles. At a higher level, this allows the organization to forecast and deliver revenue much more predictably and reliably. Finally, IT has a large strategic role to play for the business. Not only can IT be a strong partner to support the business, it can also be a strategic leader to help in forward thinking ways. How? By working with CXOs to co-define business strategy enabled by innovative technology, IT helps to improve customer satisfaction, driving and enabling business innovation, developing new go-to-market strategies and even new products and services that generate top line revenue for the company. When operating at these lofty levels of effectiveness, IT graduates well beyond support to provide competitive differentiation. As an example, consider the business impact of mobile technology. During our trip to Universal Studios in Florida last Christmas, our family discovered the Universal Studios App. The last time I was there was about four years ago, and I remember that visit to Universal being a very frustrating experience. Back then, because of the crowds we were lucky if we could visit 6 rides in an entire day with an average wait time of roughly 45 minutes for each ride. This time, with the aid of the new Universal Studios App, we were able to increase our satisfaction by 100% by visiting 12 rides in a single day. Without the addition of expensive brick and mortar rides, Universal Studios IT folks were able to improve our customer experience tremendously by providing information about the wait time for various rides, allowing all customers to better utilize their time and investment at the theme park. A consistent challenge for mid-size businesses is that either the IT leader does not have the vision, or the executive leadership is not aware of the possible roles and immense value of IT. Hence, they continue to struggle with the initial Functional Department role of IT remaining the status quo. To gain an advantage, business executives must understand that IT is a competitive weapon that must be leveraged appropriately. With Information Technology being the fastest changing industry in history, its role will only continue to increase over time. In order to stay ahead of the competition, heck, maybe even just to survive in today’s ultra competitive business landscape, executives can no longer afford to relegate IT to the back office. They must expect more from their Information Technology. In order to ignite this measure of change within your organization, get started today by working on two things: hire a capable CIO to run IT, and train business executives to create a focus and culture that demands more from IT. What role has your IT organization achieved? This is an insightful and useful model for assessing the maturity of an IT organization. Thanks for sharing Manoj! Thanks, Sean – I’m glad you found value in the article, and we appreciate having you as a blog subscriber.